Hire the perfect dress for your formal event. Don’t leave it to chance, book an expert fitting! You need to try them on. There’s really no way around it. Ball gowns and evening dresses don’t come alive until you’re in them; it’s a very intimate relationship. And you can’t do that online yet. We help to inspire you with the most flattering choices specifically for you and for the occasion. We have vast experience in dressing women for all formal events and it’s very important for us that you wear an outfit that makes you feel confident, feminine and special. Evening dresses cost about £180 to hire. We take away the stress of finding and trying the right dresses for you and all your events. 35 years of experience, wisdom and solid advice from people who care. We work one-to-one with you, in person, by appointment only. 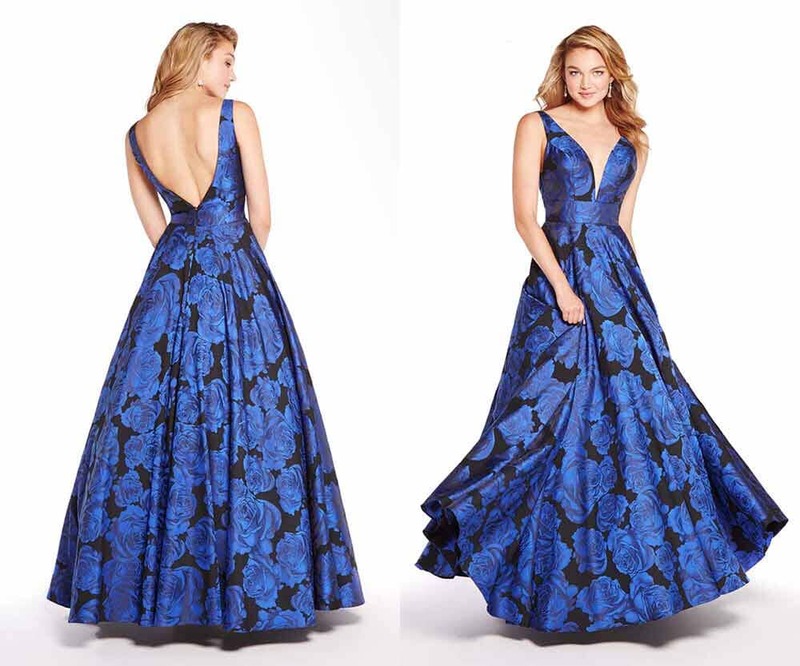 Huge selection of carefully curated evening dresses, ball gowns and cocktail dresses for all your formal occasions, all under one roof. Because our amazing studio in London has over 500 expertly chosen gowns plus accessories waiting for you to try. Smart women from all over the UK trust One Night Stand to find the right frock to suit the event and know that they can come and hire a different outfit every time with the money they’ve saved from not having to buy. One Night Stand has been proudly sending women to their formal occasions feeling fabulous and looking wonderful since 1983. We’d be delighted to dress you too! I started One Night Stand in a design studio near Battersea Park in March 1983. 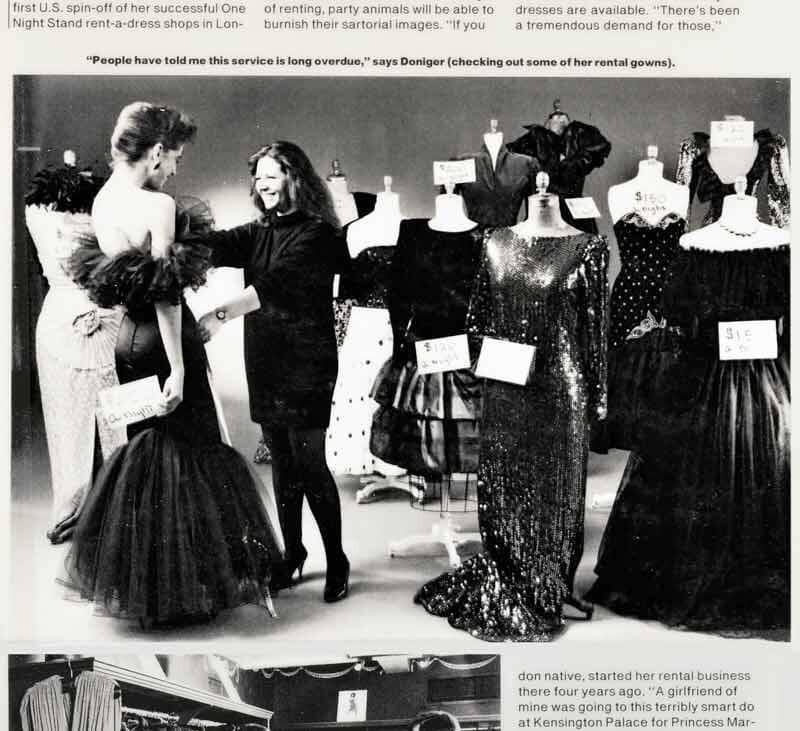 It caught the mood of the moment, with Princess Diana creating a trend for gorgeous evening dresses, and we became successful almost overnight. A year later the business moved to a shop on Pimlico Green, Chelsea, where we stayed for 16 years. I had the bright idea of launching into USA and opened a shop in New York in 1987 – just in time for the Stock Market crash. The Millienium started by moving One Night Stand, and its huge inventory, to a spacious loft in Flood Street, Chelsea, where it trades today. Thank you so much again for your brilliant service. I have passed on your details to quite a few ladies! Wonderful collection of dresses and jewellery, guaranteed to find the perfect frock for a special occasion. Very friendly and helpful with styling tips. I wanted something stylish & comfortable for the Jaguar Awards and this one fitted like a glove. Straight away I knew it was the one. I absolutely loved the rose pattern underneath and how the red popped on my skin tone. Thank you Joanna and Jess for helping me find my perfect dress! I just wanted to say a huge Thank You from both me and Meghan in how efficiently you helped us. She looked absolutely stunning for both events she took part in and both performances were a roaring success, such beautiful dresses! I wore your beautiful Princess dress to our End of Year party. Thanks again for such a lovely dress, I truly felt like a princess! Thanks again for helping me choose the perfect dress for my École Militaire event. I received many compliments on it both from French and US people! A big thank you for your help in preparing me for my big event in Barcelona. I was hosting my magazine’s first awards ceremony and the dress made me feel a million dollars! I got so many compliments I lost count. The night was a tremendous success. Thank you for your help with my dress for the Children’s Trust Charity Ball. The dress attracted so many compliments, from friends and from people I didn’t know. Many people said it was the best dress at the ball. I really enjoyed wearing it, and I told everyone who commented where I had got it from! I enjoyed visiting One Night Stand to find a glam birthday party dress. Lots of fun trying on different dresses that I would never normally dare to wear …and I did feel glamorous during the party itself! I want to thank you so much for your personalised, attentive service. You helped me find exactly the right dress for me, and the fact that you were able to tailor it to me was a wonderful extra benefit. I will definitely come back and will also tell my friends. Contact us to book a visit or tell us what's on your mind. For appointments, please give us details – event, dates, dress size, etc– and we'll get back to you. Include your phone number if you want us to call you back. Ring us on 020 7352 4848 if it’s urgent.